Congrats To The Original "My Guy"
Ryne Sandberg was named manager of the Philadelphia Phillies today. I couldn't be happier. I may have grown up a Giants fan, but I did grow up in the Chicago area. It was hard for me not to follow the Cubs. I grew up going to Wrigley. I rooted for them every chance I got. They were the hometown team, and more importantly in the National League. I'm not a huge fan of the American League and the DH, but that's for another time. I actually think the DH is coming for all of baseball and there isn't anything we can do about it. But like I said, another time. When I was 7 years old I was the youngest player on my team of 7 and 8 year olds. I had a good first year in T-Ball the season before, I was an All Star, but these boys were bigger. So I got put at second base. My arm was not as strong as the older boys, but I could field the ball. So I guess they figured that was the best place to put me. So naturally since I watched a lot of Cubs games, what with afternoon baseball and WGN, I fell in love with Sandberg. He was the guy I saw playing my position every day. His was the first batting stance I ever tried to copy. It was so quiet the way he stood in the box. I tried to emulate Sandberg every chance I got. The problem was I couldn't hit the ball. I only had 3 hits the whole 1986 season. The next year I improved a whole lot and was an all star again. I played all over the field. The Giants went to the NLCS and Robby Thompson became my guy. But Ryne Sandberg was there first. He was the first ball player I ever looked up to as a kid. I was so proud back in 2005 when he entered the Baseball Hall of Fame. I still regret not making the journey. Now I'll admit, it will be a little strange seeing him with the "P" on his hat as he guides the hapless Phillies. I figure it's how Yankees fans must feel when the see Don Mattingly in Dodger blue. I know he started out in the Phiilies' organization as a 3rd baseman. I have the baseball card stashed somewhere. 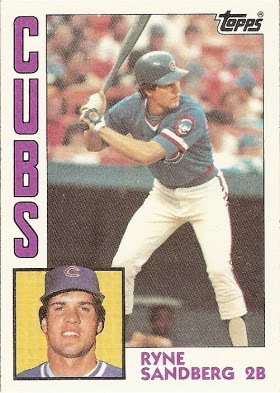 But Ryne Sandberg will always and forever be a Cub in my 6 year old eyes. I'm glad he's getting the chance to manage. He set his mind to doing it, and now it's here. Much like his career on the diamond. I won't be rooting for the Phillies, but I'll sure pull a little extra hard for number 23.